January 19, 2011. Commune di Montalbino. February 3, 2011. Nazareno Montalbini/o. February 26, 2011. Roman Stone Construction. In July, 1928, one of the brothers had the family crest researched. This is the result. 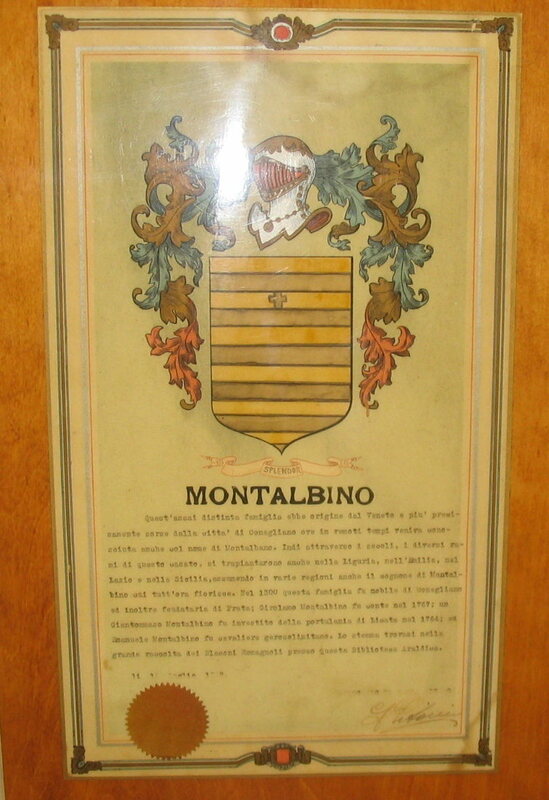 This crest is from the Montalbano Family who lived and goverened in the city of Conegliano above Venice. However, I believe our name originated in Montalbino, a small village near Florence. Nazareno Montalbini was baptized on April 8, 1850 in Serrungarina, Italy. His parents were Petro Montalbini and Angeli Sabbatineli. Serrungarina is a small fortified commune built on top of a hill near Fano on the Adriatic Coast. He fought with Garibaldi in the reunification of Italy and moved to Savignano after the war and became Nazareno Montalbino. 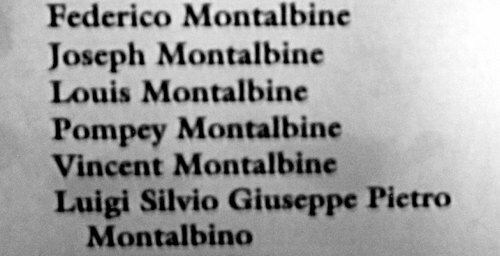 Montalbini is plural. Montalbino is singular. He was alone. Savignano is a small hilltop village with the remains of a castle and is located between Naples and Foggia. This move may have been influenced by Captain Luigi Cavallari. Our interpreter during our 1987 visit to Savignano was a Cavallari who thought that one of her husbands’s relatives was an officer in Garibaldi’s army. He married Francesca Rusco in the mid 1870's. My grandfather, Luigi, Silvio, Guiseppe, Pietro, Edwardo was born on 20 Jul 1877. He died in Savignano on 11 Oct 1922 of pneumonia . He was the oldest and named for his godparents Luigi Cavallari and Maria Giuseppe Di Prosp and his grandfather Pietro. Saletta was born on 6 May, 1878. Died in Savignano in 1952. Angelina was born on 21 January 1884. Vincenzio was born on 15 April 1886. Died in Brooklyn on 14 Dec 1944. Pompeo was born on 2 January 1888 and died 21 Jan 1954 in Brooklyn. Federico was born on 5 Nov 1890 and died 30 Apr 1957 in Brooklyn. Joseph was born on 10 May 1893 and died in Brooklyn on 14 Oct 1918. Luigi arrived in the USA the first time on the SS India, a converted sailing ship, on 16 Apr 1890 at the age of 13. He shared a compartment with 22 other men including friends and relatives from Savignano. The second time he departed Naples on 12 Aug 1899 with 12 year old Vincenzo on the SS Hesperia. They arrived in NYC on 2 Sep 1899. They had $14.00. Pompeo, at the age of 12, departed Naples on May 21 1900 on the SS Gran Antilla. He arrived on 12 June 1900. He had $1.00. Vincenzo departed Naples on 28 Oct 1904 on the SS Prinzess Irene. Arrived in NYC on 13 Nov 1904. He had $4.00. He went to live with Luigi at 15 John St, West Orange, NJ. Pompeo departed Naples on 29 Sep 1905 on the SS Konigin Luise. Arrived in NYC on 12 Oct 1905. He had $15.00. He went to live with Luigi in West Orange, NJ. There were seven other men from Savignano. Federico, 19, and Giuseppe, 16, departed Naples on 20 Apr 1909 on the SS Sannio and arrived in NYC on 14 May 1909. They had $40 and went to live with Luigi at 22 East 2nd St in Brooklyn. There were three other men from Savignano. Vincenzo departed Naples on 21 Apr 1911 on the SS Berlin, built in 1909, and arrived in NYC on 3 May 1911. He had a scar on his forehead. He went to live with Luigi at 22 East 2nd St, Brooklyn. The five brothers with their American names on the Ellis Island Immigrant Wall. I have no idea who placed them there. Jacqueline Aimers Conway placed Luigi's full name on the wall. Ellis Island was closed in June 1897 due to a fire that destroyed all the wooden buildings. Reopened in December 1900. I have been unable to find out where Luigi, Vincenzo and Pompeo lived between their arrival and Luigi's marriage. Luigi married Margaret Gazzanese on 1 February 1902. They moved in with her parents, Frank and Elizabeth, at 15 John St, West Orange, NJ. Pompeo and Vincenzo also lived there as noted above. Frank owned the house. About 1908, the Montalbines moved to 22 East 2nd St, Brooklyn. This included Luigi and Margaret with their three children and brothers Vincenzo and Pompeo. Later joined by Federico and Guiseppe. The 1910 census showed 22 people living at 22 East 2nd St. A three story row house. Luigi and Margaret with their four children and brothers Pompeo, Federico and Guiseppe. There were 13 boarders probably living on the top two floors. Luigi owned the house and it was mortgaged. The first use of Louis Montalbine I have seen is on the birth certificate of their first born, Frances Montalbine. Born 3 August 1904 in West Orange, NJ. Interestingly, the baptismal certificate lists the father as Luigi Montalbino. It was in Italian. Per Tom, Roman Stone Construction Company was incorporated on 4 December 1903. The Directors were E Alexander Hand, Arlington D Isham and Augustus S Bedell. On 17 October 1914, the brothers held their first meeting as owners of Roman Stone Construction Company. They were now Louis Montalbine, Vincent Montalbine, Pompey Montalbine, Federico Montalbine and Joseph Montalbine. Each signed his name to the minutes. Louis was Secretary, Treasurer and General Manager. Directors were Vincent., Federico and Joseph. Vincent was President and Pompey was Vice President. Interesting side note. Federico was listed as Frederick under the list of Directors. Louis was 37, Vincent was 27, Pompey was 26, Frederick was 24 and Joseph was 21. Ancestors we can be very proud of.